Long ago, before the Spanish conquistadores came to the new world, this was the land of the Muiscas. They lived in this area and practiced salt mining, agriculture, hunting and fishing. This is the place that Gonzalo Jiménez de Quezada, chose to found Santafe de Bogotá in 1538. It had plenty of water and vegetation and was an extended plain guarded by the mountains. For Spanish standards it was a perfect location to found a settlement. 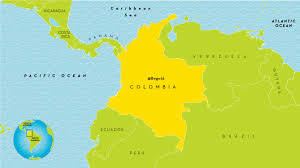 Colombia, A NEW PLACE TO VISIT. Located in the center of the Americas, Colombia is turning to be one of the hottest tourist destinations of the world for the years to come. And it is not just a promotion or publicity strategy, but it is because, this country offers so many different places with multiple climates to visit, that even Colombians amazed themselves when travelling around. This South-American country has coasts over the Caribbean and the Pacific seas. Has three mountain ranges that are part of the Andes. A huge part of the Amazon tropical forest is also here and a vast plain called los Llanos is part of this exuberant place on earth.